Coming in April, the oversized Legacy Edition box includes The Fantasy Trip: Melee and Wizard games, the Death Test boxed adventures, the In the Labyrinth roleplaying rulebook, and much more! So much more, in fact, that we've had to designate a number of components as exclusive to the first printing .*.*. there's just too much for us to afford to pack into later printings of the game. 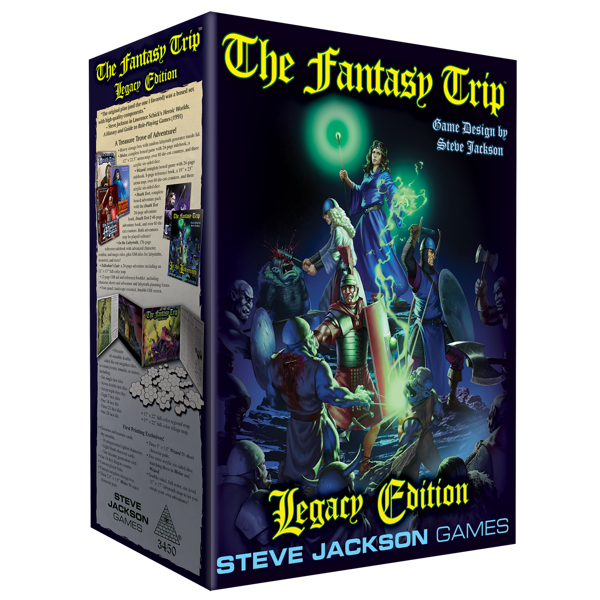 You can learn more about The Fantasy Trip: Legacy Edition at the official webpage, and be sure to follow us on Twitter, Facebook, and Kickstarter for news on the next crowdfunding campaign for new*TFT expansons and accessories. Warehouse 23 News: Get The Jobs Done Right! Making professions or heroic templates in GURPS is easier than you think .*.*. especially if you have GURPS Template Toolkit 1: Characters! This step-by-step guide, packed with advice from long-time GURPS guru Sean Punch, shows you how to make the best templates for your gaming world. Insight awaits, thanks to a download from Warehouse 23!